Culture is everything in creating family connection. Members of most cultures share values and commonly admired lifestyles to which others in the same culture aspire. In multi-cultural settings like the United States of America or Canada where hundreds of languages and cultures create a shared community, it is difficult to assess a single value placed on any one cultural practice like personal reading. International comparisons of the quality of literacy development are frequently shared through the media. Generally, they compare scores of school-age children at particular ages on tests designed to be given to many countries. These assessments are then used to support country-to-country comparisons, offering bragging rights and blushing data, designed to celebrate the strength of some and spur improvements everywhere else. The shortfall of such comparisons of literacy is that they usually look at children who are still becoming readers, not the culture of those having completed their formal education. One way to judge the status of literacy in a full culture is to determine how much reading is typical of its citizens. I recently encountered this map illustrating the relative amount of time that the average person in each of 30 countries spends reading on their own each week. That is, it serves to show the relative strength of each country’s Culture of Reading. If you tap on the images here they will fill the screen allowing a comfortable look at how various countries’ cultures include personal reading in their lives. The blue countries are the most frequent readers. The purple, read the least. This map is pretty straightforward. It tells us how many hours the average person reads each week. For example, in New Delhi, India, (which is a the top of the list) the average person reads 10 hours and 42 minutes/week. In Des Moines, Iowa, USA, (which ranks 23rd among the 30 countries), the average person reads nearly twice as much (five hours and 42 minutes/week). Intriguingly, however, the graph below shows that the USA is number ONE of 16 assessed countries in number of daily minutes of television watching (watching 31.5 hours/week) with Indians ranking last (watching 16.8 hours/week). Is there a natural connection between these data sets? 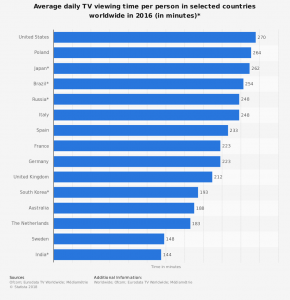 Doing the math with information presented here, after reading and watching TV, the average citizen of India has 45 minutes more a day to converse, sing, dance, pray, create and build things than the average USA citizen. These differences between our two cultures are important. Simplistically, in comparison with India, we could consider ourselves a television culture while they are more of a reading culture. Keep in mind, however, cultures are learned in families. These graphics display statistics that gathered many families’ data and averaged their habits. Some America families read A LOT more than the Indian average and some Indian families watch WAY MORE television than the average American family. However, the implied invitation here is to reflect upon the cultural emphases into which we choose for our families to live. Average Indians have made their choice to live as readers. American families have a choice also. ← When Is It Time to STOP Reading?